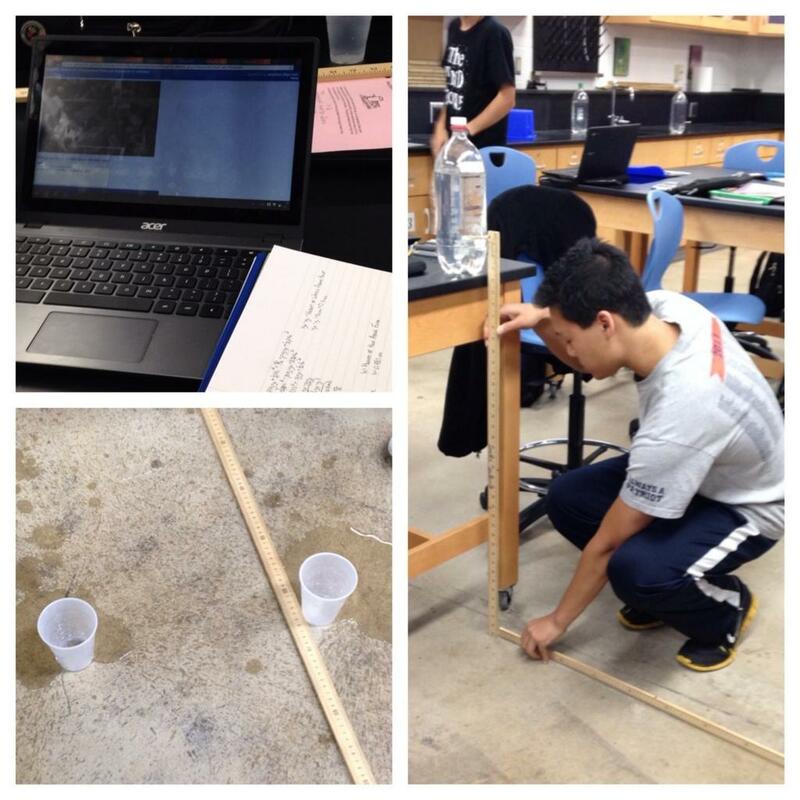 Today, AP Physics 2 students used their computational models for projectile motion of a fluid stream to predict where on the floor to place their cup to catch the water from their 2L bottle with a hole in the side. When I planned this lab practicum over the summer, I was disappointed that we would be developing a computational model for a problem that is fairly easy to solve algebraically. 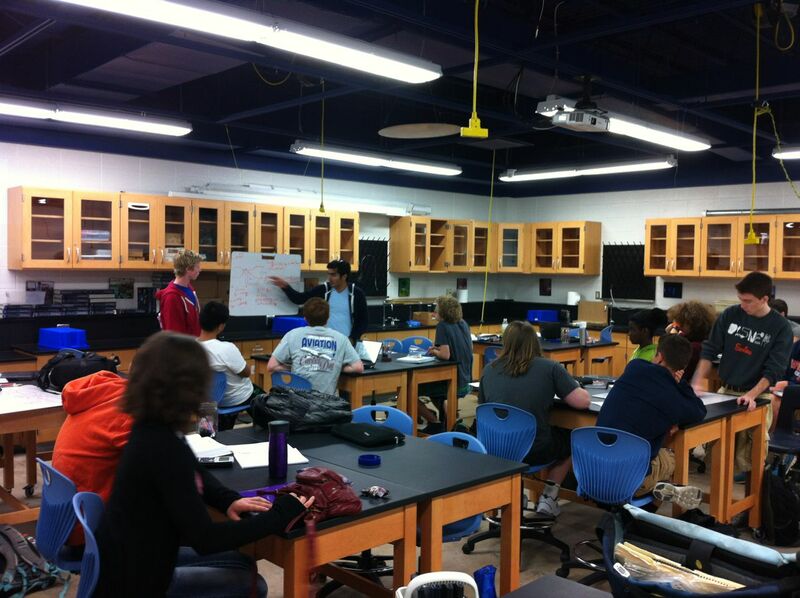 Last year, we used a computational model for a lab practicum where the algebraic solution was beyond most students. I recently remembered advice given to me from a physicist at Fermilab: students must understanding that computational models must be verified against known outcomes before they are used to calculate unknown outcomes. I emphasized this point and encouraged students to check their computational model with an algebraic solution solved by hand. While I mentioned this yesterday, I bring it up again since, today, a student remarked that the computational model was off by 5 cm. He and I were both stumped by this since the projectile motion part of the model is fairly straightforward. Thankfully, another student found the bug. The origin of the model was set to the bottom center of the bottle. The water droplet exiting the hole started a displacement of half the bottle’s width from the origin. The bottle’s width was set to 10 cm. The reported position of the water droplet hitting the floor was based on the origin being located at the center of the bottle and not at the starting position of the water droplet. The student that found the bug quickly fixed it by setting the width of the bottle and enclosed column of water to 0 cm! While totally unplanned, this nicely emphasized the importance of verifying one’s computational model! 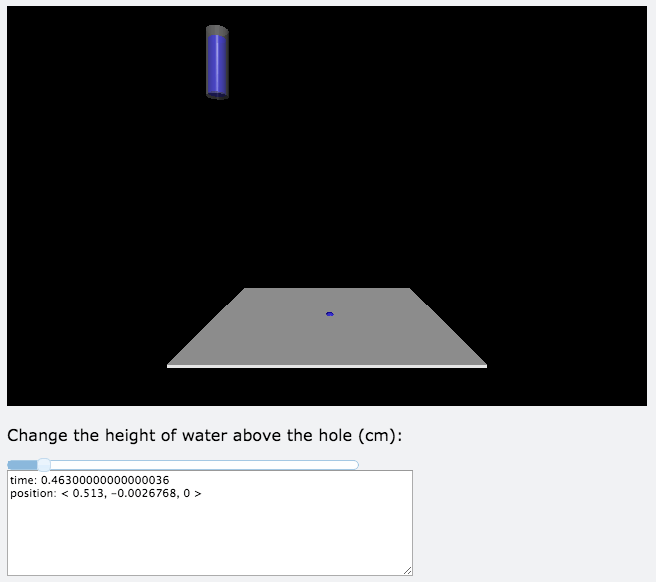 I have since fixed my model by positioning the initial x position of the water droplet at the origin. I was so busy today running around watching students demonstrate their prediction and passing out towels, that I forgot to take photos. Thankfully, @anna_kraftson was observing my class and did! Today, AP Physics 2 students had the first opportunity to modify an existing computational model to prepare for tomorrow’s lab practicum. Tomorrow’s lab practicum is to predict where on the floor to place a cup such that the cup catches the water exiting from a 2L-bottle filled to the specified level and placed the specified distance from the floor. The computation model that I provided implements projectile motion and provides the framework for modeling the bottle and water. 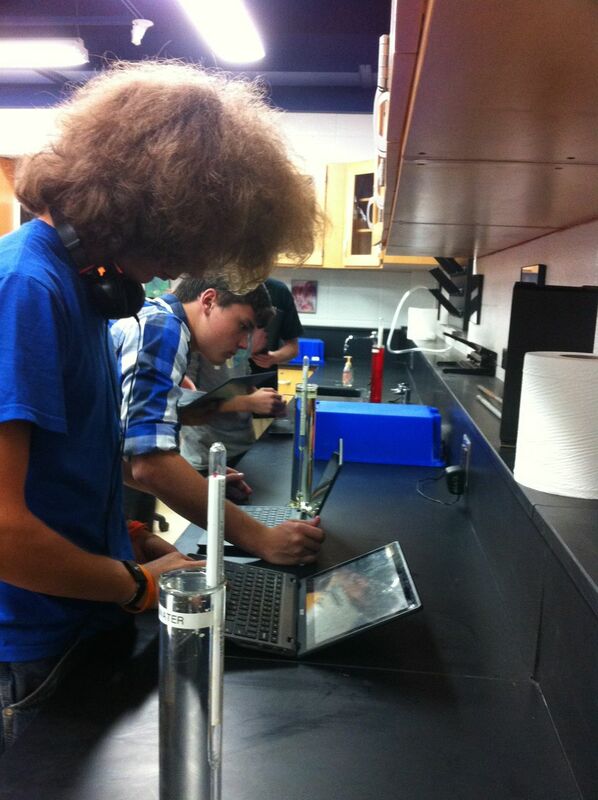 Students have to add the physics to calculate the initial velocity of the water. I also emphasized the importance of verifying your model against a known outcome before using it to predict an unknown outcome. Students are using Friday’s quiz as a test case for their model and verifying the prediction of the model against their hand calculations. 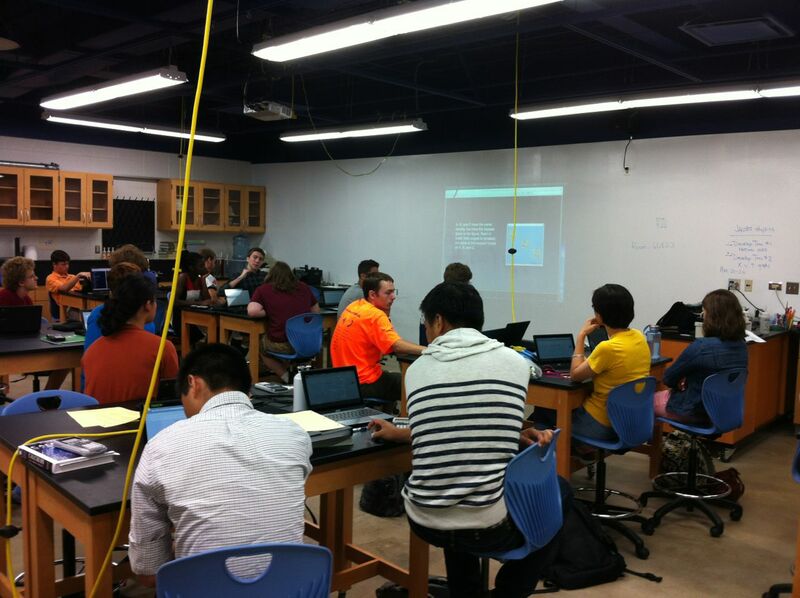 While this lab practicum doesn’t require the use of a computational model, it is another representation in which the students demonstrate their understanding. We will see how wet the floor gets tomorrow! The saltwater is replaced by an equal weight of freshwater. Indicate whether the speed of the water as it leaves the hole increases, decreases, or remains the same? Few students answered this correctly with the correct justification, and it lead to a great discussion. Some students realized and shared that the velocity of the fluid leaving the drain was only dependent on the height of the fluid in the tank and not the density of the fluid. (They basically derived Torricelli’s theorem.) 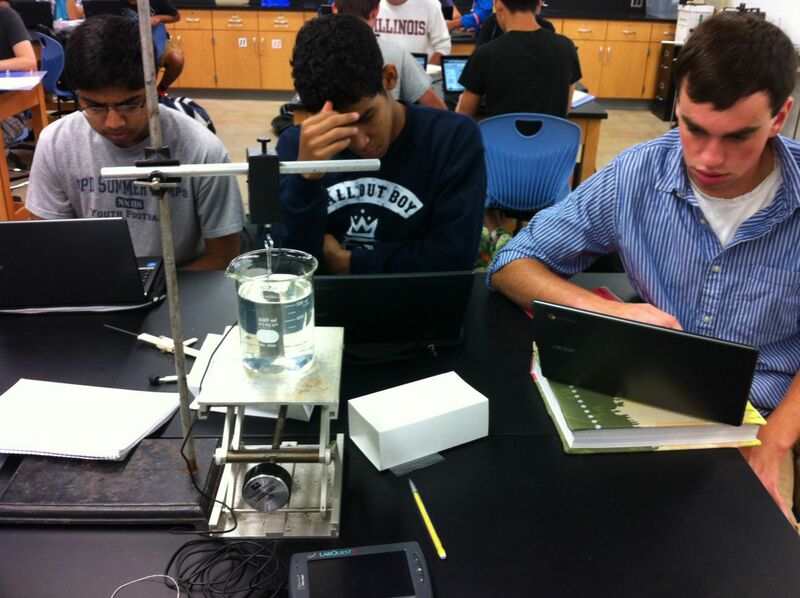 Few students, however, appreciated that the saltwater was being replaced by an equal weight of freshwater. In order to have an equal weight of freshwater, a greater volume, and therefore greater height, of freshwater must be in the tank. Since the height increases, the velocity of the fluid leaving the drain would also increase. It’s tough to anticipate the style of the questions on the new AP Physics 2 exam. I hope I’m on the right track. 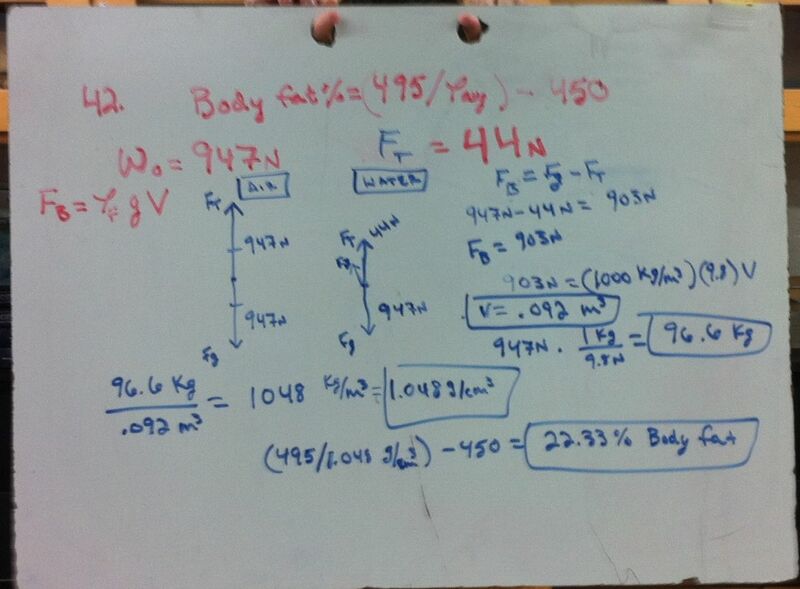 In AP Physics 2, we whiteboarded the fluid dynamics problems today. This went better in that the questions and discussions were richer than when we whiteboarded the fluid statics problems last week. I expect this was due to two factors: one, students were better prepared; two, the problems were more challenging. In one class, we had a great discussion about why the pressure in an unconstrained stream must be atmospheric pressure. In another, we had a good discussion about how reasoning through a problem conceptually can provide bounds on possible answers that can be used to evaluate the reasonableness of the calculated answer. In the past, I’ve reinforced a simple (and incorrect) explanation through a misapplication of the Bernoulli Effect along the lines of “the dime lifts off the table because the Bernoulli Effect states that the fast moving air above the dime has lower pressure and the stationary air below the dime has high pressure.” My newly found deeper understanding began when I noticed a single phrase in the definition of the Bernoulli effect in Knight’s College Physics (emphasis mine): “The pressure is higher at a point along a streamline where the fluid is moving slower, lower where the fluid is moving faster.” The Bernoulli effect can only be applied along a streamline and not between streamlines. 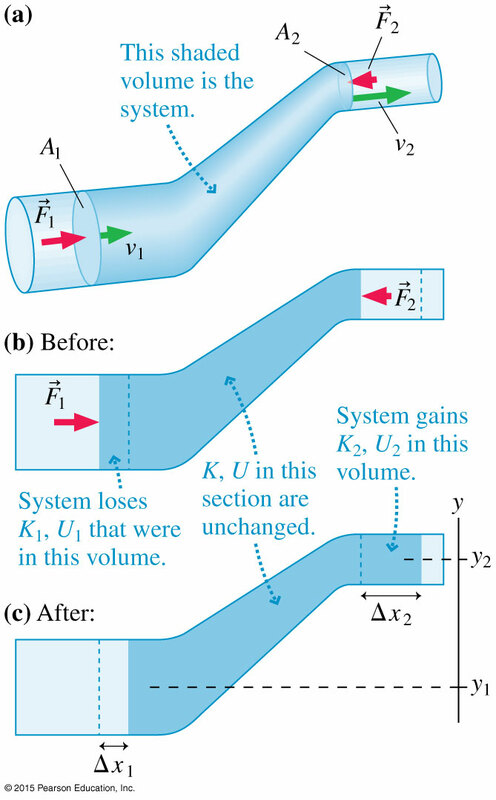 In addition, the Bernoulli effect focuses on a pressure gradient accelerating a fluid, not just the pressures associated with “fast” and “slow” fluid streams. So today, I focused on how the streamlines are diverted over the top of the dime. The closer together the streamlines, the faster the speed of the fluid (justified with the equation of continuity – conservation of mass). The velocity of the fluid (air, in this case) increases as it is diverted over the leading edge of the dime and decreases over the trailing edge. The key factor is not that there is fast moving air over the dime but, rather, that the velocity of the air increases as it flows over the leading edge of the dime. Therefore, there must be a region of lower pressure over the dime. Students were generally pleased with this explanation, but a couple were unsatisfied because we didn’t explain the cause of the region of low pressure over the dime. After reflection, discussion with my colleague, and some research, I think the best conceptual explanation focuses on the path of a particle along a diverted streamline. Since the path is curved, the particle experiences a radial acceleration toward the center of the curve. This radial acceleration requires an unbalanced force and the only force applied to this particle is a pressure difference perpendicular to the particle’s velocity. Therefore, on the concave side of the curve there must be a lower pressure than on the convex side of the curve. The combination of this effect across multiple streamlines results in the low pressure region over the dime. Tomorrow, I’ll see what my students think about this perspective. Today we checked our understanding of static fluids with a quiz. I’m modifying AP Physics B free response questions to reflect what I expect the new AP Physics 2 free response questions will be. This usually involves fewer step-by-step prompts and a greater emphasis on justification of application of the concept. We again used InfuseLearning for peer instruction. I love that InfuseLearning supports ranking tasks, but am getting frustrated that I get disconnected at least one every class period which disrupts the flow. Time to file a support ticket. The problem using the Siri equation and Archimedes’ Principle to estimate a persons body fat percentage. I modeled a sample extension question by asking the group, “if the person was submerged in oil instead of water (ick! ), would the weight underwater increase, decrease, or remain the same?” I then followed up with a challenge when the group responded that the buoyant force on the person would change by asking, “but yesterday we said that the buoyant force on the hydrometers were the same in all fluids. Can you remedy this apparent contradiction?” I’m trying to coach the students into using these whiteboard problems as prompts for conceptual questions that require careful reasoning and justification. I’m still undecided if gathering this information in this manner will be useful, which means I’ll at least try it again. What I can’t figure out is how to adjust the scores afterward since I accidentally swiped the wrong student a couple of times.